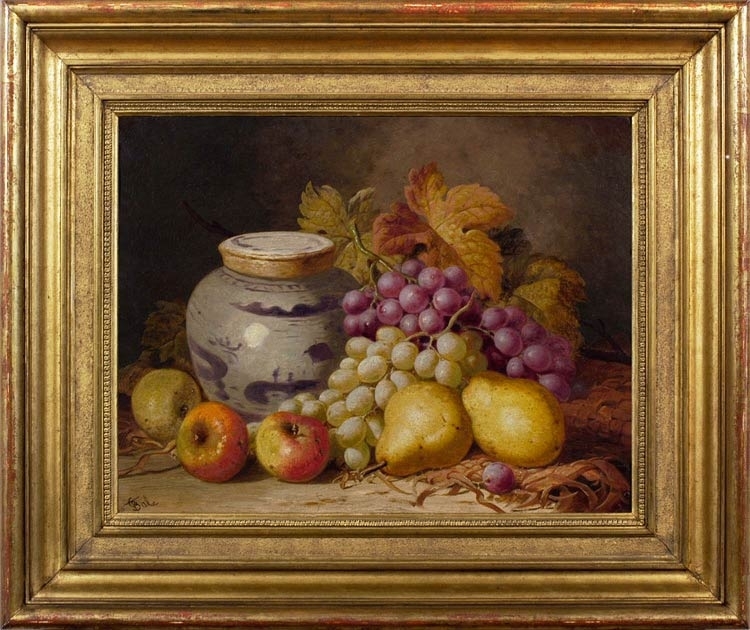 A particularly attractive example of Bale’s still life painting, this includes a ginger jar he painted several times, as well as the grapes he was so fond of. Many of his paintings are solely decorative works, produced as ornamental ‘furnishings’ for country houses and the villas of the aspiring middle classes; however, this present image seems to have a symbolic depth beyond the aesthetic arrangement of form and colour: to hark back to the moralizing spirit of 17th century Dutch still life subjects in its presentation of mortality and decay. The autumnal leaves on the bunches of unblemished grapes are standard in Bale’s repertoire, but the apples he has chosen have not, similarly, been plucked at the height of their perfection, but are pocked and scabbed with the marks of age. They are a hectic red, like fruit past its prime, and – in the Biblically-aware 19th century – would have been redolent of the apple picked by Eve, which let entropy into the world. Little is known of Charles Thomas Bale (fl.1866-92), save that in 1872 he exhibited at both the Royal Academy and the Society of British Artists in Suffolk Street. He was an extremely prolific artist, producing hundreds of still life paintings which depict various combinations of fruit, flowers, birds’ nests, game, silver and earthenware jars. These seem to be almost entirely in private collections, possibly because of their domestic scale and decorative content; although the work of many of his peers (Eloïse Stannard, Oliver Clare and William Henry ‘Bird’s Nest’ Hunt) has been more openly recognized. The 19th century was a golden age for still life painters, and numbers of them flourished throughout the century, from William Henry Hunt (b.1790) to Catherine Wood (d.1922). Bale shares with them a fairytale or Arcadian vision of plenty, in which the largest works arranged extravagant cornucopias of fruit, etc., over shelves or Turkey carpets. His work individually has been compared specifically to that of George Lance (1802-64) and the latter’s pupil, William Duffield (1816-63), both of whom had connections with Belgium. Bale also painted genre scenes, landscapes, and a few scenes of social realism; he signed his work either ‘C.T. Bale’, or with a monogram. Works in public collections include Still life with dead game, a pair (both Wakefield Art Gallery).